American Buffalodown is a de-haired product just like cashmere, qivuet and yak. Due to the newness of the American buffalodown the definition of the term wool has not been broadened to include the wool of the bison yet. 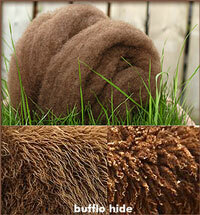 Bison fiber is made up of course guard hairs and fine downy hairs. The guard hairs are hollow and range from 21 to 110 microns in diameter, with an average 59 microns (this is similar to course human hair). The fine downy hairs are solid and are covered with fine scales. Downy fibers range in diameter from 12 to 29 microns. The fiber micron average for the downy hair in dominant animals is 21.8 and for subordinate animals is18.8. This is similar to a fine sheep's wool. 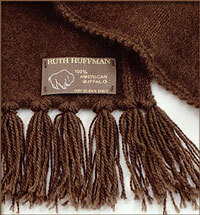 The moisture regain of bison wool ranges from 13 to 20 percent. This is a broader range than that of sheep's wool, which ranges from 14 to 16 percent. Moisture regain is a measure of the amount of moisture a fiber will hold without feeling wet and is used to understand the comfort level of a fiber. The more moisture a fiber will hold, the more comfortable it is to wear. Buffalodown is strong, fluffy, very insulating and warm. It is warmer than wool. It also has the ability to retain much moisture without feeling wet, which makes it a great product for ski wear and cold weather wear in general. According to the spinners who work with the buffalodown, they say that it has more bulk, bounce and resilience than other exotic fibers. Bison fiber has no lanolin, which many people are allergic to. Lanolin is also what moths like to eat. Per pound it is priced similar to a high quality cashmere. Buffalo rovings and yarn are available for purchase in our online store.